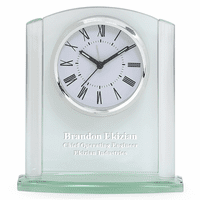 FEATURES/SPECS The beauty and simplicity of this square arch personalized desk clock will make it a thoughtful gift for coworkers and loved ones alike. 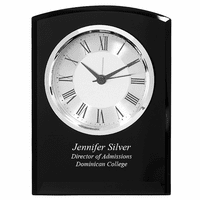 The rich mahogany finish wood face is bordered by a polished black glass background. The body is attached to a gold tone base. The clock uses a quartz movement. It has a two tone dial, with black roman numerals, black hour, minute and second hands and a gold alarm hand. It runs on 2 AA batteries (which are included) giving you the freedom to display this desktop timepiece anywhere. 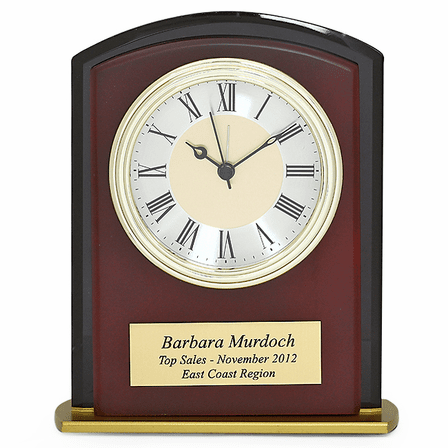 Add a laser engraved brass plate to the wood face, below the clock, free of charge, perfect for employee recognition awards and corporate gifts. Dimensions: 6 3/4" x 5 1/2"
I would like to personalize this and also have our company logo on this. Can we have both? A font size of 40 for the first line "Congratulations" and a size of 35 for the name and credentials on line two looks good. A lot of people make line one slightly larger. If you'd prefer both lines to be the same size, a font size of 35 for both lines looks really nice. We give these clocks out when someone retires. These clocks are well made and look great. They make great gifts. This item was ordered in advance of a presentation to our best man. When it arrived, the font and size of the engraving had been completely ignored. I immediately replied to customer service to let them know of the problem and requested correction and overnight shipping so the event would not be ruined. The corrected item was not shipped as requested and would not arrive in time. The piece had a nice appearance. The actual workings of the clock were extremely cheap. Merchant Response:We totally messed up on your engraving font, sorry! You requested Larissa, we engraved the Arial font. We did send a replacement overnight to you, but it did not arrive the next day as our shipper promised us, sorry again! We will contact you to see if you'd like a refund. ConsVery bad experience. Go with a local company who handles the engraving in-house. Excellent product. Very tasteful and extremely well made. This will be my go gift. Very pleased and very reasonable. This is a very classy, well engraved product with which I am very pleased. Wanted to order something special for our pastor's 30th anniversary with the church and this is just what we were looking for. It was ordered on a Tuesday and arrived the same week that Friday. We did not need it immediately, but it is good to know about the quick turn around. ProsSharp, classy looking. Engraving is done very nicely. Great price. When I received much clock it was just was I was expecting. I can't wait to give it for a chrismtas present. I'm very pleased with it. Purchased three to show appreciation to co-workers who have dedicated varying years of service to our company. Clean, polished and sophisticated look to them. This is the 3rd clock we have purchased and this is the the perfect retirement gift. 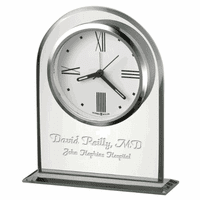 This is engraved perfectly and is shipped quickly. Thank you for a perfect retirement gift that is both economical and beautiful. Great product, nice retirement gift. Very fast shipping. I have ordered two of these items and have been very pleased on both occasions. This is a very nice retirement or anniversary gift for a work event and was very much appreciated by the employee. We will certainly be purchasing from you again! Thank you! Beautiful Gift at a great price! I am very pleased with this item. I purchased it for our retiring Pastor, and I know that he is going to enjoy it. Other reviewers mentioned that it's small, but I think the size is just perfect for a desk. The engraving turned out beautifully. I would highly recommend this desk clock. ProsPerfect size for a desk. Engraving is very nice too. This is a very classy looking clock that makes a great gift. It is smaller than I expected from reviewing the picture. Engraving very well done. Delivery very rapid. After hunting for a retiring item for a co-worker for several days and seeing items well over 100 dollars, we ran across this site. They did not charge all of those little extra fees which runs up the price, so the price you see is the price you get! The customer service (Pete) was the best. We will definitely come back for our future needs and will recommend without hesitation. Item was shipped within 5 days as well. GREAT CLOCK, FAST SHIPPING, AND VERY GREAT PEOPLE TO DEAL WITH ! This was a gift for my wifes boss for Christmas and my wife loved it and her boss was very surprised and loves it ! You all did a GREAT job and we would recommend you to anybody ! THANKS FOR A VERY GREAT JOB !! MAY GOD BLESS !